Within seconds of exposure to sarin, the affects of the gas begins to target the muscle and nervous system. There is an almost immediate release of the bowels and the bladder, and vomiting is induced. When sarin is used in a concentrated area, it has the likelihood of killing thousands of people. 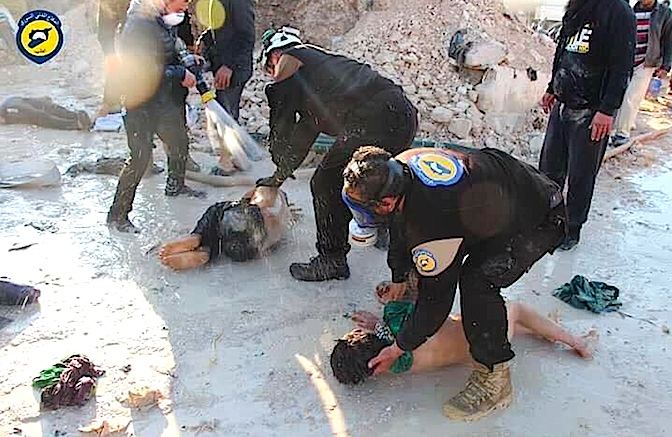 Yet, such a dangerous gas, and the White Helmets are treating bodies with little concern to their exposed skin. This has to raise questions. Why are the attendants not wearing gloves?